APAAME_19980512_DLK-0050. Photographer: David L. Kennedy. This large stone built town on the western edge of the Basalt Desert of Jordan had a significant Nabataean settlement, but expanded greatly during the Roman period. This photograph goes back in the archives to 1998, our second year of flying and a big one with nine flights! Taken almost directly vertical over the ruins of Umm el-Jimal, it seems all the more outstanding as it was before we made the transition to digital photography with the benefits rapid fire and automatic focus. You can see more photographs from Flight 19980512 here or more of Umm el-Jimal here. 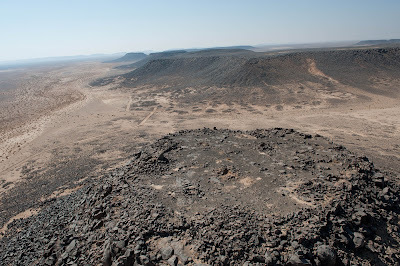 This mesa in the basalt desert of Jordan is very remote, but the cairns on the surface have been illicitly excavated. When we recently visited this site the surface was strewn with both modern and ancient inscriptions on the basalt boulders, testimony that despite its remote location it is has been a popular 'spot' for centuries. And why not?- as you can see the view is simply breathtaking. Our themed Pic of the Day today: Two doves in the bell tower of the Greek Orthodox Church at Bethany on Jordan, 2011. Please let us know of you interest be emailing Maire Gomes. Next lectures in the series: Saturday 24 March, 2012. 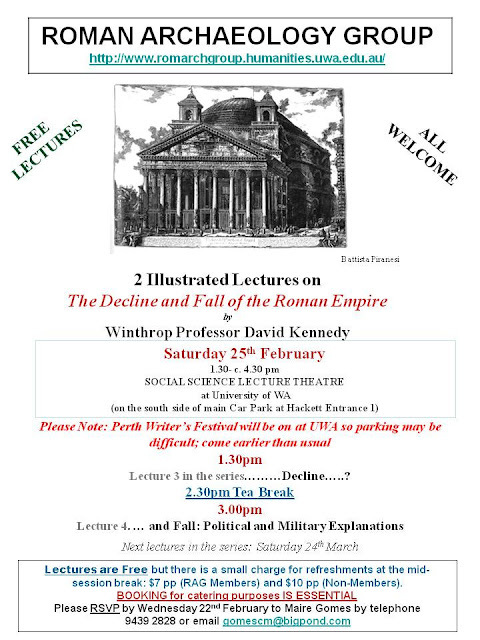 The Perth Writer's Festival will also be on campus that weekend so plan ahead with public transport or brave the limited on campus parking.